On October 30, 1931 Clarence John was driving home from a long day at work at his bowling alley in Oconto. It was 11:30ish at night and pouring rain. This is the road Clarence was driving on, Hwy 22 going west. Here is a photograph of the damage done to Clarence’s 1929 Roosevelt Coupe (the photos were in the court case file). The driver of the motorcycle was Harvey, a 20-year-old, who was accompanied by a friend. Harvey lost a leg due to the severity of his injury. His father, acting as his guardian, sued Clarence for damages and the case was brought to Brown County Court in March of 1932, however there was a request to change the venue to Oconto County, which was consented to. There were no witnesses to the accident other than the three people involved. The only testimony in the case is from Clarence. Below is a scan of the first page from the testimony. According to his testimony, he had half interest in a bowling alley in Oconto, at the armory, which he ran all by himself. He was living in Gillett with his wife, Myrtle, and his parents. They had no children at that time. Clarence answered the suit against him with a definite ‘not my fault’, stating that the driver of the motorcycle was driving too fast for the conditions and lost control. Harvey’s lawyers and guardian denied the fault was his. The damage that is visible on Clarence’s car does look like the other driver hit him, not the other way around. But in the end, we only have Clarence’s testimony, none from Harvey. In 1948, 15 years later, we find the case continued, because Clarence had yet to pay the $5100 he owed to the plaintiff. I have checked with Findorff and they tell me that John terminated his employment with them sometime during the spring of this year. However, the motor vehicle dept. informs me that he has an automobile registered in his name – – -1936 Plymouth coach…residence being Crandon, Wisconsin. Under the circumstances , there is no point in my filing the certified copy of the judgment, inasmuch as there is absolutely no chance of my garnisheeing his salary or having execution issued. In the event he is traced to Madison again, I will be happy to grab him by his pants. There may be a chance for you to have his car picked up if he has returned to Crandon. This process continued until July of 1953. At this time Clarence was finally found in Wausau, and served, Harvey had made action to start the process of suing him, he was worried because the judgment would lapse in August of that year. Clarence refused to show up in court, instead sending his attorney to file one paper which stated that since the judgment, he and his family had resided in Wisconsin all that time. They never received papers regarding the execution of the judgment, or even an attempt at communication, and that such in-action in all this time negates the ‘good cause’ requirements of the judgment. Basically, making it null and void. It looks like Clarence really didn’t want to pay this debt. But he never asked for an appeal to the judgment, which kind of makes his excuse a bit thin. In the end all this work that Harvey put into getting his money came to nothing. My grandfather, Clarence, died in February of the next year, (1954). On his father’s birthday. *Wikipedia definition of judgment-proof: In the context of debt collection and civil litigation, the term judgment proof is commonly used to refer to defendants who are financially insolvent, or whose income and assets cannot be obtained in satisfaction of a judgment. Being “judgment proof” is not a defense to a lawsuit. If sued, the defendant cannot claim being “judgment proof” as an affirmative defense. The term “judgment proof” instead refers to the inability of the judgment holder to obtain satisfaction of the judgment. If a plaintiff were to secure a legal judgment against an insolvent defendant, the defendant’s lack of funds would make the satisfaction of that judgment difficult, if not impossible, to secure. Auto-Motorcycle Collide Friday Eve. on H’y 22, The Gillett Times, Gillet, Wisconsin, Thursday, November 5, 1931; No. 11, page 1, column 2. Harvey Andrianssen vs. Clarence John, Circuit Court case #12741, Oconto Series 36, Green Bay ARC, UW Green Bay, Green Bay, WI. (Photographs from the accident taken from case file.) If interested in case just ask me for a copy. 1. Friday, Mar 1 1918, p8c3, No. 26 32nd year; Forest Republican, Crandon, WI —Crandon Public library digital images. 2. Friday, Mar 22, 1918, p1c2, No. 29 32nd year; Forest Republican, Crandon, WI —Crandon Public library digital images. Ukulele plans found online: https://stansplans.com/ukulele_prplans.html. Get krackin’! I have been having fun finding more digitizied newspapers available online. The Oconto County papers have been exceptionally good, and now I am finding some from Crandon. This amusing tale was in the paper when Clarence, my grandfather, was 19 years old. 1. Friday, Jul 19, 1918, p1c1, No. 46, 32nd year; Forest Republican, Crandon, WI —Crandon Public library digital images. It was pure chance that I was preparing this post for this week, and Veteran’s Day is Saturday. Brilliant. To all the veterans in my family, past and present, thank you for your service. Clarence with his State Guard Reserve unit. (He is in the back row, straight back from the gentleman sitting on the far right in front.) His designation was provided by the Wisconsin Veterans Museum in Madison. In 1904 the Wisconsin State Legislature enacted Chapter 434. Both my grandfather Clarence Fredrick John and his uncle Milton Cain were members of the Wisconsin State Guard (or in Clarence’s case it was the State Guard Reserve). Milton went on to fight in France with the Rainbow Division. My grandfather, on the other hand, never stepped foot in Europe, or Africa for that matter, during this war. He did not turn 21 until October 29, 1919 and the war was over a little more than a week later. The State Guard was organized after the Wisconsin National Guard went overseas to join in the war effort in July of 1917. The first units of the State Guard that were organized were in Milwaukee, Oshkosh, Fond du Lac and Green Bay. 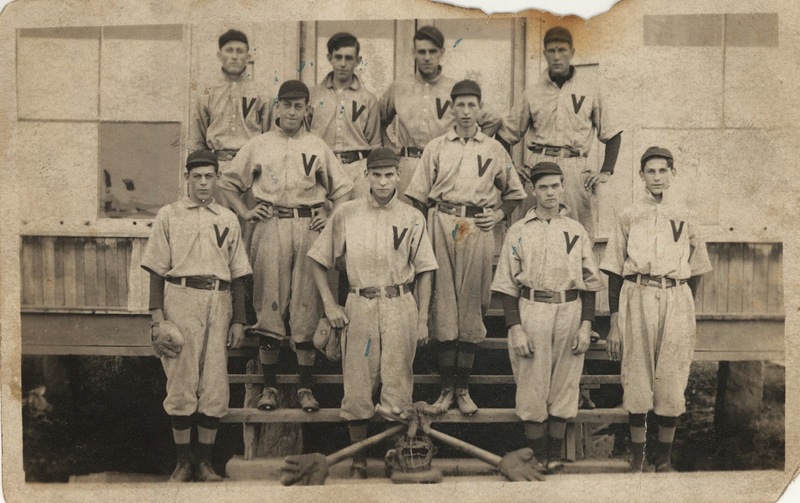 The men recruited were all volunteers who were too old or too young for the draft. Its first encampment was at Camp Douglas in July of 1918. It was comprised of four regiments of infantry and a State Guard Reserve. In total about 5,500 officers and men. The Guard was paid an allowance by the state for: armory rent, upkeep of clothing, and the expenses connected with their training. However, the men in the Guard were all volunteers so received no wages or pay. And if you were in the State Guard Reserve, you paid for your own equipment and uniform. The camp was commanded by BG Charles King, a retired officer of the Wisconsin National Guard. He trained the men as if they were regular army, and their competence after a few days of intensive training, along with their own drills at home, was impressive. In his report to the adjutant general Gen. King complimented them highly. From the family album. Clarence Fredrick John in his State Guard Reserve uniform. It was understood that joining the State Guard did not exempt the men from the draft. Those who were too young to join at that time would be eligible for active service when they reached the age of 21. The older men could be called up if they ran out of young blood. 1. Sept. 16-18, 1918 Clark County; to assist in search for draft dodgers. 2. Aug. 20-24, 1919 As guards during the Cudahy riots. 3. Sept. 9-12, 1919 Troops were assembled in the armory at Manitowoc, for use in strike riots at Two Rivers, but they were not used. The State Guard was incrementally disbanded starting on May 5, 1920, as the National Guard was slowly reactivated in full, a process which was completed in 1921. Clarence was with the 26th Separate Company of Crandon.5 He sure does look cute in his duds. He apparently liked to say that his ship was turned around at sea because the war was over, so he never got to fight. It makes for a nice story, but I am doubtful that that was the case, as he wouldn’t have had time to be on a ship heading overseas, less than two weeks after he was of age. He might, however, have had his bags all packed and been raring to go. 2. Email from: Horton, Russell <Russell.Horton@dva.state.wi.us. 3. “State Guard to Camp Douglas”, The Farmer-Herald, Oconto Falls, Wis., Friday, June 28, 1918. Page 4 Column 2. 5. “…found a Clarence F. John in the State Guard Reserve microfilm. It appears he with the 26th Separate Company, which seems to be based out of Crandon” — email from Wisconsin Veterans Museum, 30 West Mifflin Street, Madison, WI 53703. Clarence John and Myrtle Hamm, newlyweds. My father remembers being told, when he was younger, that his parents had met when Clarence was injured in a train accident and Myrtle was taking care of him at a hospital in Marshfield where she was working as a nurse. The Gillett Times, v27n50, Gillett, Wisconsin, Thursday, August 4, 1927, page 1. It is believed that Clarence received a pretty hefty settlement from the railroad and this is probably the money he used to start his own business. A bowling alley. The Gillett Times, v28n15, Gillett, Wisconsin, Thursday, November 29, 1928, page 1. Here is a matchbook saved by the family from the bowling alley. It is said that because Clarence’s venture started not long before the crash of 1929 and folks no longer had extra money to spend on luxury outings, such as bowling, the business didn’t last very long. But, I have no proof of that yet. I guess I will have to dig a little deeper. In 1931, a little over 3 years after they met, Clarence and Myrtle ran away to Illinois and were married at the court house. Was it love at first sight? Only they know, and they aren’t talking. I have been unable to track down exactly when this event happened, as it is most likely that the newspaper this article appeared in hasn’t been digitized yet. I am guessing that Clarence was in his late teens to about 2oish, as he is talked about as the son of Mrs. and Mr. V. H. John, which tends to make me think he is still a young man and not on his own yet. The red pin on the map market the location of Kelly Lake, Gillett and Oconto are on the map so one can see its location in relation to the two cities. I am glad that my grandfather was there that day to be a hero. As, I am sure, was the lady in distress. During WWII my grandfather Clarence Fredrick4 (Victor Hugo3, Fredrick William2, Ludwig1) John was too old to join as a soldier, being about 45 years of age. However, his expertise in road building, that he acquired working for the Forestry department in CCC camps in Wisconsin, was put to use in Greenland where he helped build runways for the military. Clarence left his wife and 3 children for about a year to do his part to assist in the cause. Below is his SS Fairfax passenger list entry, after its arrival back in the US, at Boston at the end of December 1943. During his time in and around Greenland he took, and had taken, many pictures to remember his time there. (Because of all the snow it is difficult to see the details in many of the pictures.) He put together an album of all these pictures so that he would have something to show the students in the Crandon Grade School, when he gave a talk to over 400 students with whom he shared his adventures. The mission was boringly named by Germans as the “German Greenland Expedition,” and it wasn’t their first attempt to establish radio stations in Greenland. The US Navy haunted the coast of Greenland with the purpose of hunting and destroying secret radio and weather bases that were being set-up in various remote locations Greenland by the enemy. And it wasn’t until many months after this particular event occurred that the US Navy revealed what had happened, for security reasons no doubt. Early in 1943 this secret base had been discovered, in May it was bombed by Army Air Force planes, and in September it was finally wiped out by a Coast Guard-Army expedition. The Germans occupying the small base had evacuated. But two German soldiers were eventually taken prisoner, one who had been captured and one who stumbled, accidentally, into the hands of the Americans. 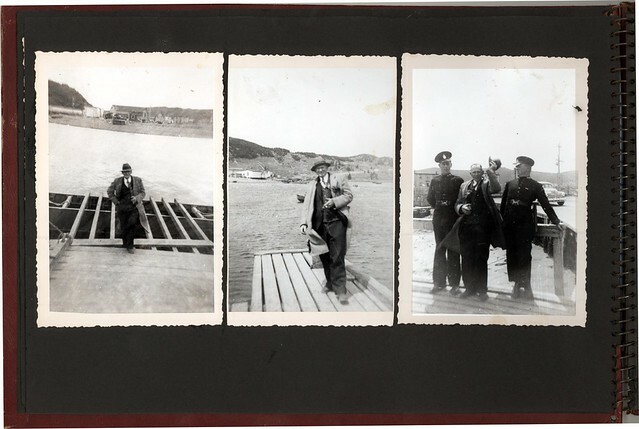 The base on an uninhabited small island off the east coast of Greenland, had a small contingent of men from the German Navy. It was discovered by a sledge patrol consisting of Danish hunters who kept an eye on the coast for the US Navy while hunting. The two groups engaged in a battle and two Danes ended up being taken prisoner, another was killed. However, there were survivors who managed to get away and report the discovery to the US soldiers. After the battle the Germans banded together a party and headed north with the intentions of attacking the Danish weather station there. With machine guns under the cover of night, they attacked, but most of the Danes managed to escape. The German commander attempted to get one of the Danish prisoners to collaborate on a mission up the coast, but at the first opportunity the Dane overpowered the Nazi and after a 40 day trip back, delivered him to the Americans. Not much was left of the base when the Americans were done bombing it, as can be seen in the pictures. The Germans were pretty persistent and continued making attempts to establish bases, as the Navy encountered several German air patrols and engaged them over the next few months. Clarence must have been along for the ride when the US soldiers made a trip to the base to make sure it was destroyed. At no time is an exact location given, but it must have been pretty remote for it to take 40 days to get a prisoner back to your allies. You can read the complete details in the article, which was published in November of 1943. Clarence had a small clipping of the event from another paper in his scrapbook. He didn’t see combat, but he did get to witness an exciting intrigue related to the war. Spies and secret bases oh, my! A similar base discovery was filmed in 1944, so one can get a feel of what the Navy was doing when they found the bases and how the ships were getting around the frozen ice in the area at the time. While not the 1943 event, it is close enough for horseshoes. 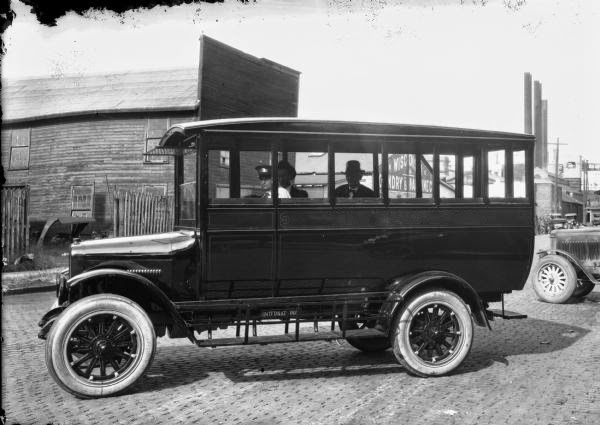 A jitney bus about 1924. Image from Wisconsin Historical Society. One memory that stands out for me from when we lived in Manila, was the jeepney busses (similar to jitneys) that drove around the city, with all the bright colors and decorations, which included fringe and beads hanging from the windows. They were pretty cool to watch, especially when you are a kid. Who would have thought that my grandfather would have been part of the jitney craze that hit America in the nineteen teens and continued until about 1923. 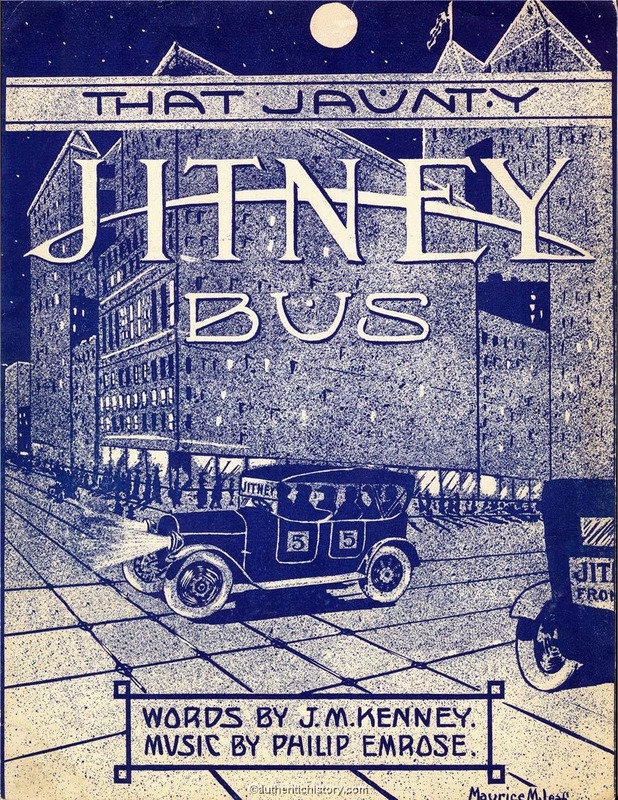 The jitney business, (according to a 1915 article I found1), is said to have originated in the southwest, due to the recession which broke out just after WWI, and is believed to have started because of a street car service strike. An intrepid businessman seeing folks in need, took the opportunity to make a few extra nickels in a poor economy by charging them for a ride in his automobile. They were called ‘jitneys’ because they cost a nickel to ride, and slang for a nickel at the time was ‘jitney’. This idea took hold like wildfire, spreading across the country with great enthusiasm. It apparently also caused massive headaches for local city councils who were wholly unprepared for the problems this craze would cause. Problems like congestion and increased street accidents. Local trolley lines and chartered transportation companies began losing money as a very fast clip as fewer folks were using their systems. City officials and public utility commissioners were now tasked with the necessity of regulating the ‘rampant individualism’ that was causing such havoc on their streets. Fleets of automobiles were appearing unexpectedly on local streets and not conforming to any regulations. Anyone who was unemployed, wanted to change jobs, had an automobile, regardless of skill or experience, was getting into the business. Street accidents became frequent due to congestion, defective automobiles, reckless driving, and competition amongst drivers. The railroads, trolley lines and taxi companies with franchises to protect, were all solidly against the jitney. In some cities councils, sensitive to the ‘established order’ of their towns attempted to legislate the jitney out of business. One way this would work was to make jitney owners responsible for any accidents they are involved in. they were becoming too expensive to run. Some of the advantages of the jitney as opposed to the other modes of transportation available to folks were: quicker service, a more comfortable and cleaner ride, cheaper, and not as noisy. Jitneys could provide service to suburban and interurban areas. Transportation strikes would never affect the drivers, they weren’t in a union. They also helped make a city prettier by eliminating the need for trolley poles and lines. The nickels spent for the ride generally stayed local. And, hey, chauffeur! The jitney definitely made big business sit up and take notice, their strap-hanging public had an alternate mode of transportation and were using it. I have no idea how long Clarence ran his business or where in Wisconsin this happened. But I am sure hoping that I can find out. The craze had many a song written about it. 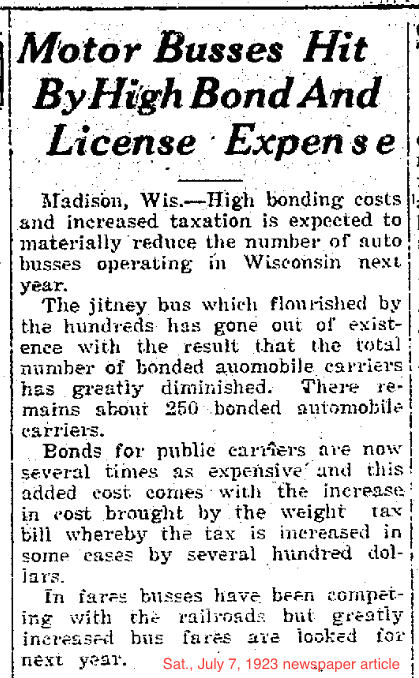 1 The Jitney Bus Problem, by E. S. Koelker, page 87; The Wisconsin Municipality, volume XV, January to December, 1915; Madison, Wisconsin. A case of researching the ex-spouse to solve a mystery. For my father, finding out that Clarence had a wife previous to his own mother, Myrtle, was quite a big shock, as was the fact that he had a half-sister he never met! Clarence had done a pretty good job of keeping it a very closely guarded secret from his own children, but everyone else in the family knew her and their daughter, and had even kept in touch with them over the years. The big questions I wanted to answer were: when did this first marriage end, and where? To do this I first needed to find out more about Esther, because research on Clarence hadn’t helped. During earlier research attempting to pin down when they might have been divorced, I had found her in 1930 living with her father and Marie (the half-sister) in White Lake. The census did indicate she was divorced, but, I still didn’t know where or when. I had tried to find a divorce for them in Forest County, but no luck. I decided to continue the search further ahead in time, so I went to the 1940 census. Bingo! There she was in White Lake, with Marie, only now she is married to an Oscar Christenson and they have two daughters of their own. This was excellent news, because, usually, on these later marriage records there is a question regarding any previous marriages. As my niece lives in Antigo I asked her to drop by the register of deeds office and see if she could find the marriage in question. A few days and a text later, there it was in black and white: previously married to Clarence John, divorced October 28, 1923 in Merrill, Lincoln County, Wisconsin, the answer to both of my questions. Now I could also breath a sigh of relief, because my grandfather had definitely not been married when he met my grandmother. 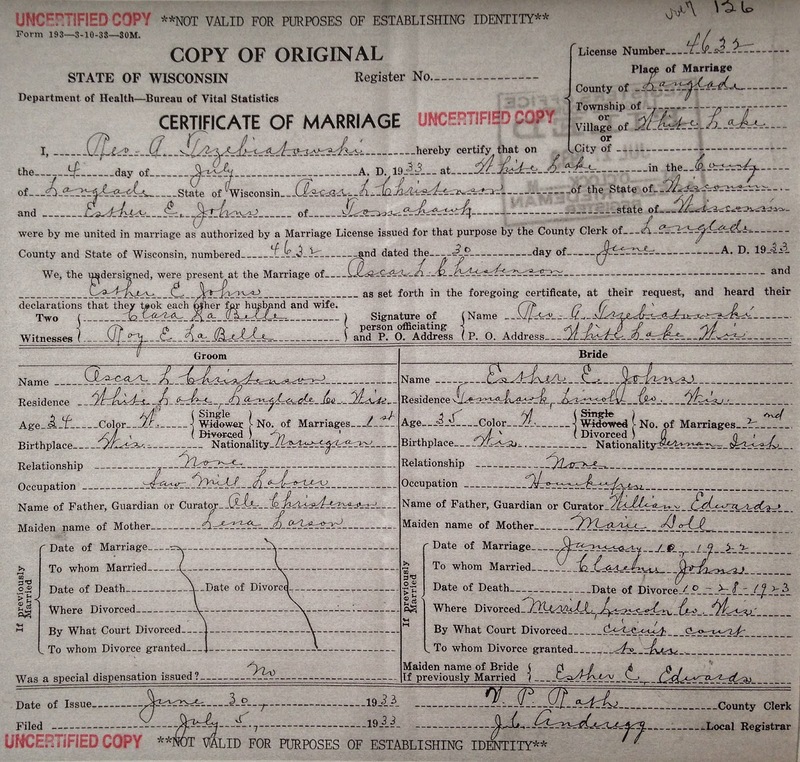 Marriage certificate for Esther and Oscar. But of course it didn’t stop there. My first thought was, “Wow, only married a year and a half-ish. What went wrong?” The clerk of courts in Lincoln county informed me that they had divorce records from 1926 and on a little late for me. So I searched ArCat (the Wisconsin Historical Society Archives Catalog) then contacted the UW Stevens Point Area Research Center, (which holds records from Lincoln County) and asked them to sent me the case file for Clarence and Esther John/s from Lincoln County. Four days later it arrived. The file isn’t big. Probably because Clarence never showed up in court to contest the petition or testify, even though he had been summoned to do so. 1. That she and the defendant were married at Waukegan, Ill., on January 10th, 1922; that she has been a resident of the State of Wisconsin all her life. 2. That there has been born as the issue of said marriage, one child, a girl, named Gertrude Marie; that said child is now nine months of age. 3. That beginning shortly after said marriage the defendant began a course of cruel and inhuman treatment towards this plaintiff and that some of his acts are as follows: That three months after said marriage he struck her in the face with his fist and caused her to have a black eye; that he repeatedly struck her [‘and kicked her’ is marked out]; that he has sworn at her frequently and called her indecent names and accused her of infidelity and has slandered her by telling untrue and indecent things about her character. That ever since said marriage, the parties hereto made their home with the parents of the plaintiff on an agreement that defendant was to pay one-half of the expenses of running the household and furnish the wood; that he failed to carry out this agreement; that he failed to provide her with sufficient money to support herself and said child and she was obliged to look to her father and mother for sufficient funds wherewith to maintain and clothe herself and said child and was also obliged to use a part of her savings which were on deposit in the bank at White Lake, Wis; that she had an edowment insurance policy made payable to him on which a premium became due shortly after said marriage and he refused to pay the same and she was obliged to pay it out of her savings; that at Christmas time, 1922, he gave her no money wherewith to purchase necessitites for any Christmas remembrances and she was obliged to use her own funds for such purpose; that shortly before March 1st, 1923, he was abusing her and continued the same for a period of about one week, [‘when he left home and she did not know his whereabouts for two or three days’ – lined out] and finally on March 1st, 1923, he left her and they have not lived together as husband and wife since said date; that he is lazy and when he does get work, he cannot hold a job on account thereof; that a part of the time he runs a Jitney line; that after March 1st, about May 1st, she was obliged to enter a hospital in Antigo on account of sickness and previous to that during March and April while she was sick at home he did not call on her or see her or inquire about her condition, so far as plaintiff knows, and saw her only once during all of the time she was in said hospital; that he refused to pay her doctor bill or store bill or hospital bill until compelled to pay the doctor’s bill by law, and she was obliged to pay the store account and nurses’ bill and paid $70.00 hospital bill for the time she was in said hospital at Antigo. 4. That defendant is a strong and able bodied man and has earned at common labor, $3.50 per day and while in his Jitney business earned at least $5.00 per day net; that plaintiff has had some training as a clerk and stenographer and is capable of earning good wages but on account of her recent sickness will not be able to secure a position for a period of about six months; that she has, at all times, kept her marriage vows; that since his desertion of her, on March 1st , she has been obliged to a part of the time, pay for the care of said child; that she has not sufficient money or means of her own wherewith to carry on this action or support said child. 5. That plaintiff’s maiden name was Esther E. Edwards; that no prior action of divorce has been commenced or is now pending between the parties hereto. The divorce was granted on October 24th (not 28th as Esther indicated on her marriage certificate, a minor quibble). They weren’t officially divorced until a year after that date though. Esther and Clarence were married in early January of 1922. Gertrude Marie was born in early August of 1922. Which means that Esther could quite possibly have been pregnant when they married. I do not know if Marie was premature, by about a month, or not. So, if they did marry because she was pregnant, it is quite possible that they married for the usual wrong reasons, and as so often happens in these cases, it didn’t work out for them. I have a hard time believing that my Grandfather would behave in such a manner. Granted, I never knew him. But nothing I had ever heard about him indicated he would commit these kinds of acts. However, one has to remember when reading this testimony that before the advent of no-fault divorce in the United States, a divorce could only be obtained by showing one party to be at fault in the marriage. It meant that one spouse had to plead that the other had: committed adultery, abandoned the family, or (one I have seen in many divorce cases in my years at the archives), committed cruel and inhuman acts, which usually included physical, mental and verbal abuse, even if none of this occurred during the marriage. Many American lawyers and judges were advocates of no-fault divorce because they wanted to eliminate the need for perjury in the court by the parties involved in the cases, where they wanted out of a marriage for a variety of other reasons that weren’t deemed acceptable in court. By 1985 all but New York had adopted some form of no-fault divorce, it wasn’t until 2010 that New York finally passed a no-fault divorce bill. So one does have to take these early divorce testimony records with a grain of salt. He could quite possibly be guilty of some of these charges, including his failure to pay bills. He was the oldest son, so he was probably a bit spoiled, and he was barely in his mid-20s at the time of his marriage, and divorce, so he might have had some growing up to do yet. For me the mystery is finally over. One case solved, of the many remaining. In fact, comparatively speaking, this one was a piece of cake, once I settled down to solving it. Of course now I want to know all about this Jitney business! Clarence John, sometime between 1916-1928 in Wisconsin. He is clearly wearing a Chicago White Sox uniform. Family rumor had it he played for a farm team for a short while. Unfortunately, I can find no record of Clarence playing for a farm team or for the White Sox. I checked with the Baseball Hall of Fame. 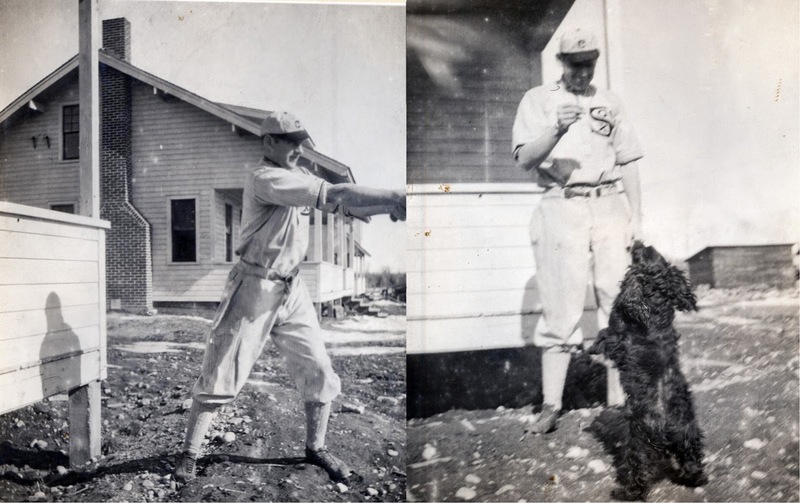 It is possible he played for a local team that took on the name of the White Sox. Although I find that idea, passed on to me by an acquaintance, not very likely. He does look cute in his uniform though. One of the Shepard boys with his ball team, he is front row second from left. It could be my great-grandfather William Shepard, Sr., but I would have to confer with Mother about that.